The experience will move you. The Jeffers received the US$28,500 grant that would allow him to complete his studies to become a commercial pilot from the hands of Regina LaBega, SXM Managing Director and Ms. Jean Christian after whom the scholarship award was named. He expressed gratitude to the airport and exhorted other St. Maarteners to persevere and not give up on their dreams. Prime Minister Sarah Wescot-Williams, despite repeating that she is an advocate of government-owned companies sticking to their “core” business, praised the management of SXM Airport for establishing the scholarship, and therefore contributing to increasing the “human resource index” of the island. She was also full of praise for Ms. Jean Christian, the island’s first female Air Traffic Controller, whom she called her friend, for her contribution to the field of aviation on the island. “In the same manner, we consider education to be one of the cornerstones of our corporate social responsibility. Hence our adoption of the Prins Willem Alexander School, the launch of our ‘HEALTHFAST: Breakfast in a Box’ pilot program for elementary schools at the beginning of this year, and now the establishment of the Jean Christian Aviation Scholarship,” LaBega said. 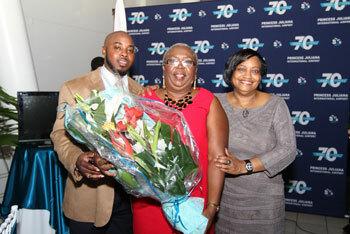 An emotional Ms. Christian, who received a standing ovation as she rose to address the gathering, disclosed that it had always been the dream of her father to establish a Flight Academy on St. Maarten. This scholarship, she said, broadened the horizon to include other sectors of the aviation industry. She urged the recipient to heed the advice of senior pilots and to be disciplined. An impromptu intervention by Reint Laan, a retired schoolteacher, who counts among his former students popular TV talk show host, Oral Gibbes of World Star Studio, initially raised eyebrows but ended with a warm ovation. Laan, who was hosted by SXM Airport in his current tour of the island performing his play, “The flying Dutchman and his cub, a dream come true” presented a copy of the book to Kevin Jeffers, expressing the hope that the Jean Christian Aviation Scholar would soon realize his dream of flying. The event was held at the former Plantation Restaurant upstairs of the meet and greet area of SXM Airport and included singing by the students of the Charlotte Brookson Academy of the Performing Arts as well as entertainment by Destiny Band. The evening ended with a buffet dinner. © 2019 Princess Juliana International Airport Operating Company N.V.